Students who pursue a specialization in information assurance will be the people who manage the risks related to data, information systems or applications for businesses, agencies and organizations. Through your coursework, you'll develop advanced knowledge in the field of information security. You'll learn the advanced skills and techniques for handling issues related to risk management, business continuity and disaster recovery. You'll find those skills are in high demand in a wide variety of fields. 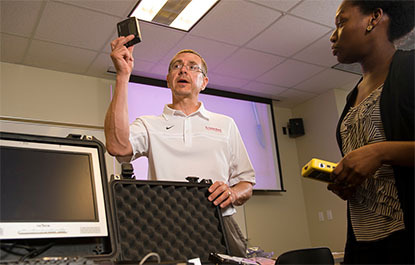 Latest tools and technology are available in the recently remodeled Centennial Hall on campus. Three classes (nine credits) required for certificate completion. 35 years of accreditation by the Association to Advance Collegiate Schools of Business (AACSB) and AACSB International. Faculty internationally recognized in the field. Three labs house about 170 computers running Windows and Linux.